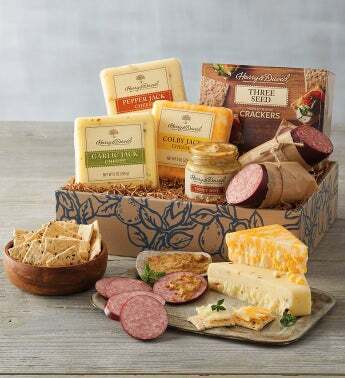 Designed for the meat and cheese aficionado, the Deluxe Meat and Cheese Gift Box is rich with savory delights. Featuring three varieties of Jack cheese, two kinds of sausage, and our zesty honey hot mustard, this gift offers all you need to create fabulous appetizers. This meat and cheese box makes a great gift for any occasion and pairs well with wine.